One of our recent assignments saw us help the organising committee of the Toronto 2015 Pan American Games to develop a rapid way to compile lots of venue reports into one end of day report. 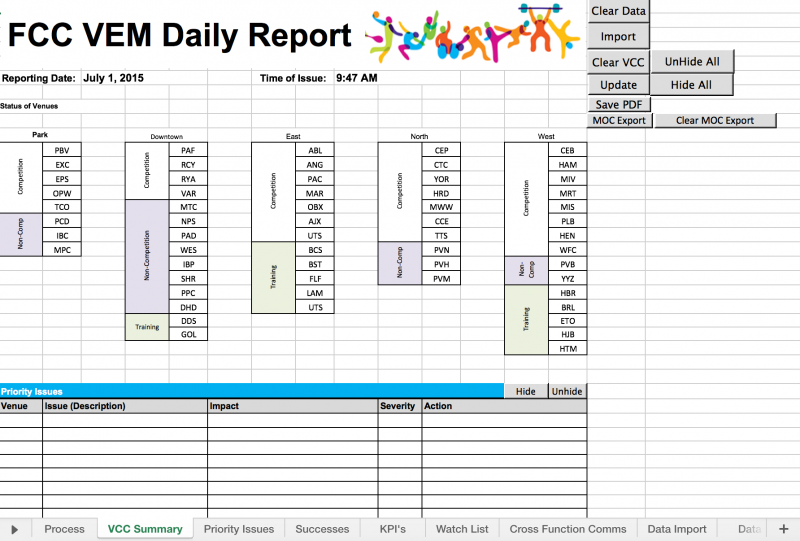 Due to the late stage in the games when we were asked to support this requirement, it was too late to create a full reporting solution, so we were asked to see if we could pull something together using Microsoft Excel and some custom macros. While we don’t encourage this approach for a number of reasons, we are always happy to help our clients get past the finish post and this was a great example. To develop the solution we took the user requirements excel spreadsheet for a single venue and developed an aggregation spreadsheet which pulled all the data from identical spreadsheets which were pre-loaded into a specific folder. This then re-ordered the data to provide a simplified summary and dashboard. The macros did the hard work of making all the data align in the right place and summarising the end of day status across the theater of operations and buttons simplified the interface. While we would not recommend to our customers to adopt this approach, we managed to get a working solution to the end of day Main Operations Center reporting problem that served the organisers well. So what would have been our recommended approach? Get in touch and we can show you some much cleaner and effective methods.